﻿Robby Hedge has been doing theater and dance all her life, incorporating her love of the stage with her passion for developing young performers. She truly believes in seeing that each child has his or her turn in the spotlight. With dual degrees in theater and elementary education, Robby is uniquely qualified for this most important role—serving as your child’s guide to the fun, wonderful world of the dramatic arts while ensuring their safety and artistic progress. After earning both a B.S. in Theater and a B.S. in Elementary Education from the University of Colorado, Robby spent time in the state, studying dance for two summers with legendary Modern American Dance founder and Broadway choreographer Hanya Holm and acting in summer stock at the Golden Horn Theater for four summers under the direction of the late Bill McCabe. While in Colorado, Robby also co-founded a theatrical touring company. In her multiple roles as director, performer and producer, she experienced all aspects of the theater and deftly used that knowledge to bring many Broadway musical hits to the center stage during her 10 year tenure there. Upon moving back “home” to New York, she founded her theater company, where up until now participation has been word of mouth, making it Westchester’s best-kept secret in children’s drama discovery. In keeping with the latter, the company recently changed to its current name (Drama Discovery) to be able to give each of its students the insight into his or her own imagination. Because of her academic background and extensive experience with children, Robby modeled her company to work within children’s natural inclinations for pretend play and role-playing. She found that instead of compartmentalizing the drama experience into individual skills, such as acting, dancing or singing, children garnered the greatest benefits by jumping right into the production. She discovered that by beginning play rehearsal immediately, children learn to act, sing and dance among other skills in a causal context—and this works best with their still-developing senses of patience, time and association. Even after having directed over 200 youth theater productions, the sparkle in a child’s eyes when the curtain rises will never lose its magic to Robby. That’s why she strives to ensure that the sparkle is always there. Imagination and creativity abound here, all so that each child can feel important like the star that they are. Robby having a post production discussion with the cast of "The Lion, the Witch and the Wardrobe" as Director of The Young Actor's Theater Company of the Colorado Springs Fine Arts Center. One of the young students there was Celia Brooks, now an acclaimed London-based food writer and presenter who makes regular television appearances on the UK Food channel. Throughout her years in the industry, Robby has been fortunate to work for and with many wonderful individuals who have been very gracious in their kind words for her and her work. "Robin's influence on my son and his work has been formative and expansive. She is brave, genuine, strong, vulnerable, unique, and, at her best, 'visionary' in the best sense of the word." "I have never seen a director of children, amateur adults or professional who evoke more creativity and dedication from actors . . . 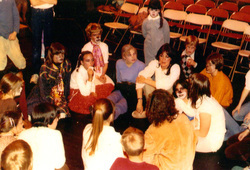 I have stood in the wings while she engaged the cast in a post-performance evaluation; five and six year-old children were as seriously involved in the discussion as any professional actor. She brings out the best performances in children I have ever seen, often from shy, uncommunicative kids." "Robin directed The Secret Garden . . . she was able to create success for each child; to encourage, coddle and push in just the right amounts to allow each actor to grow. The performance was a great success, a tribute to Robin's ability to organize, direct and follow through." Robby's passion was brought on by her family's involvement in the arts and being constantly surrounded by creative individuals. Her great grandfather was John Coryell, a prolific writer of serial stories for “dime novels,” the late 19th-century and early 20th-century U.S. popular fiction form. 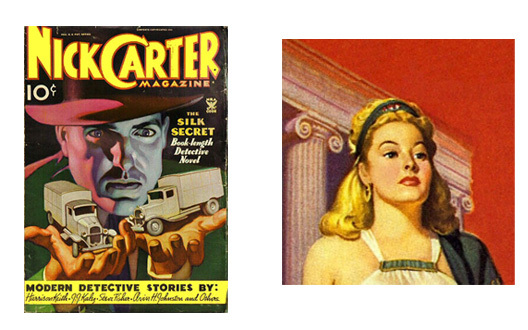 Coryell created the Nick Carter detective series, which first appeared in New York Weekly in 1886. Over 1,100 Nick Carter stories were published in the 1930s and the character was later serialized in three films by MGM as "Nick Carter, Master Detective" starring Walter Pigeon. Her mother, Dolly Coryell, was a Julliard-educated concert pianist who later taught kindergarten in Chappaqua, NY for over 30 years. She would often bring Robby in to direct her children in school plays. She was also married to Rudolph Belarski, the acclaimed American paperback cover artist and master of "pulp art," the colorful, action-packed or pin-up laden paintings that sold countless books and magazines during the 1930s and 1960s. Her husband often used her as a model for his illustrations and artwork.